Imagine that you are lying comfortably and fully clothed on your back on a treatment table, your head on a shallow pillow, your knees supported by another pillow to keep your lower back from being strained. Your eyes are closed. You breathe deeply. The practitioner slides her hands under your neck and shoulders, and seems to intuitively find the sore spots in the tense muscles. S/he begins to press points gently yet firmly, holding each for several minutes. The pressure is enough to make you aware of the tension, without being painful. Soon you begin to feel a gentle pulsing in each point, like a soft vibration. There is a sensation of warmth being released, as the points begin to open up and soften, and the muscle tension melts away. The practitioner’s fingertips seem to just follow that opening, slowly sinking deeper into the tissue as your body feels comfortable with the finger pressure. Then s/he moves on to the next points, opening them up as well, and on from there, two points at a time, connecting them energetically. You feel yourself drifting off into a state of deep relaxation. Waves of energy pulse through your body. You see shapes of colors that keep changing. At times you might get an image, something that might remind you of something, like a memory stored in your body. As your body relaxes and releases tension, you might feel emotionally more open. Tears might start to flow; maybe a feeling held under the surface is finally coming up and out. The practitioner assures you that this is okay, that this is a safe space to let that happen. You feel held and cradled. Somebody is there to witness the process happening in you. The JSD acupressurist invites you to talk about your experience if you wish. You have the option to follow this invitation and process some of your feelings, sensations, images or emotions. Or you can choose to remain silent and be in the moment, without having to talk about what is going on. A gentle dialogue might enfold. The practitioner encourages you to find words and images describing your experiences. When you begin to get too much into your head and start interpreting what is happening, s/he gently brings your awareness back into your body: “What’s happening in that area now? “Stay with that sensation.” “What does this block feel like? Is it dense or soft? light or dark? sharp or dull?” Such questions help you go deeper into your awareness. You are amazed at how such a simple form of therapy can have such profound effects—how holding a few points without too much pressure, with the fingertips being steady and still, can move so much energy. The setting is helping you to feel safe. You remain clothed; you can open your eyes and see what is going on if you wish; there are no needles to worry about. The practitioner checks in with you frequently to ask how you are doing, if the finger pressure is comfortable, if being touched in a certain area feels safe to you. You feel like you’re in charge of the flow of the session— its pace and its intensity. The JSD acupressurist follows your process, listening to your body. S/he follows the prompts of your body, moving to areas that call for attention. S/he is just being present with you. The time passes quickly. At the end of the session you feel deeply relaxed, open, more connected and centered than before. Welcome to Jin Shin Do® acupressure! “Jin Shin Do” means “The Way of the Compassionate Spirit.” This refers to the practitioner’s intention to just stay present with whatever process happens, compassionately, without forcing or judging. Jin Shin Do® acupressure was developed, beginning in 1976, by California psychotherapist Iona Marsaa Teeguarden. It is a unique synthesis of a traditional Japanese acupressure technique, classic Chinese acupuncture theory, Taoist yogic philosophy and Qigong breathing methods, and Western bodymind work such as Dr. Wilhelm Reich’s theory of segmental armoring. JSD acupressure uses the same points as acupuncture, but instead of needling, the points are held firmly yet gently with the fingertips. Usually two points are combined—one in an area of local tension, and the other distal to it, but on the same “meridian” or “channel” (energy pathway). The distal points help the local point to release more deeply, easily and pleasantly, by helping to disperse the stagnation and restore a smooth flow of vital energy (Qi). 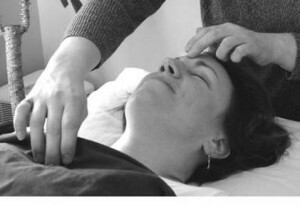 What makes JSD acupressure unique is the aspect of bodymind awareness. A JSD acupressurist guides awareness to the body sensations, feelings, emotions or images that arise during a session. Sometimes s/he prompts you by asking questions, or by encouraging you to describe the process, explore a sensation or image, or release a feeling or emotion. Sometimes s/he might tell you the name of the point and the image connected to it, and this might open up a powerful process. Words spoken are as powerful as touch given, and are carefully chosen. I vividly remember treating a woman in her early 40s who wished to conceive but felt a lot of ambiguity around that choice. During one session, focusing on her breath, she noticed chest blockages that she described as a “burden or heavy load.” I shared the name of the point I was holding, “spirit burial ground” (K 24). Opening this point can bring buried aspects of the spirit to the surface. She responded by sharing her story of an older sister who had died at birth and whose grave had recently been moved, bringing a “buried” family secret to the surface. She explored feelings about the burden she felt around being the “replacement” of her sister and being guarded by her parents as a child. Not so surprisingly, she came to the next session with a clarity of intention that she was resolved and ready to have a child of her own. This example illustrates beautifully the magic that can happen when we follow the sensations of the body-mind and trust its process. In 1988, as a new immigrant from Germany, I felt insecure speaking English, so I explored my nonverbal skills. JSD caught my attention due to my background in counseling psychology and my interest in Wilhelm Reich’s work. I studied JSD in Santa Fe, NM with Gayl Hubatch, and became a registered practitioner in 1991. I later studied body-mid work with Kamala Quale in Oregon. Jin Shin Do® opened up a way to work with the mind and emotions through the body-mind, an effective treatment that went beyond the limits of “talk therapy”, shifting energies on a deeper level. I subsequently studied acupuncture at Oregon College of Oriental Medicine in Portland, OR. I have practiced in Portland, ME, since 1997, combining acupuncture and Jin Shin Do®.